A photo of our Observatory taken by the light of a quarter moon. Take a look through our 0.61m Telescope or 8″ Celestron Telescope, watch a slide show, check out our computer software. Come look for yourself and see the planets, the moon, comets, galaxies, nebulas, and globular clusters through our telescopes. Ask a friend about us, chances are they have heard about us or have already visited us. 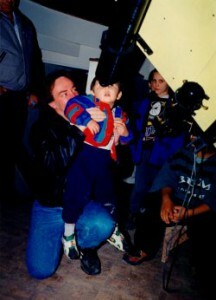 Over the years we have had thousands of people from Prince George and all around the world visit our Observatory. The Prince George Astronomical Observatory is open on Friday nights during the Fall and Spring Public viewing hours. The Fall session is from mid-August until the last Friday in November, and the Spring session is from the start of February to the last Friday of April. If you want to know if the Observatory will be open, refer to Public Viewing Friday Night Open House Status on our home page. How much does it cost? Its Free! However if you like what you see, a suggested donation of $2 / person would be appreciated! Help us to bring Astronomy to Prince George. If you want to book a group tour of the Observatory, Please see the Tour Booking Page. You do not need to book a tour on public observing nights; however if your group can only make it out on a non-public night or it is a large group, we will open the Observatory for groups of 15 people or larger. For group tours see the new suggested donation amounts under Tour Booking (of course you can always donate more!). These Scouts were star struck!! Anyone may book a group tour but Cubs, Scouts, and Girl Guides are especially welcome. Click here to see a map to the Observatory. The observatory phone number is (250) 964-3600. The PG Centre owns and operates a 0.61m Cassegrain Telescope, in one of the largest facilities of its kind in Canada! The telescope is housed in an unheated dome to reduce air turbulence and improve the view through the telescope. If you get too cold you can stroll back down to the heated classroom and warm up or perhaps view a presentation on the data projector. The Observatory contains the following rooms: Main Observing deck (10 person capacity, unheated), a Washroom, a Classroom (50 person capacity) and the Telescope Control Room. You can view through a 0.61 m Cassegrain , 8″ Celestron, or a number of smaller Newtonian telescopes! View astronomical slides and presentations in our 50 person classroom, check out astronomical software, learn about astrophotography and what a CCD camera is, or just come out and look at the stars through our telescopes and enjoy the night sky. Astronomy can be enjoyed at any age!